Some 25.000 Finnish rockers gathered in the Olympic Stadium to see Australia's only worth-buying export product. We had to wait some time as bluesman George Thorougood and his band took the stage first and I gotta admit I was bored to death by their show. This kind of 1-4-5 laid-back primo blues-rock is barroom music for an audience of 50 drunk hillbillies but definitely no stadium rock thing. Bad choice for an opener! 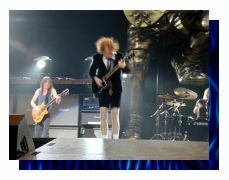 The crew was relatively fast and AC/DC took the stage in some 20 minutes after Thorougood was gone. There was no use to wait any more as at this time of the year it never really gets dark in Helsinki, so the gigantic light-show the band has brought was almost all in vein. However the usual video-screens were rather entertaining. 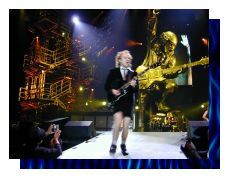 The show started out with the Angus statue video that turned into the first some seconds of the "Stiff Upper Lip" video clip. The band sneaked on stage during those seconds and started playing the song. The sound was so crystal clear that at first I didn't even recognize they were already there playing as I was watching the screen. The filming crew they bring with them for years now is doing a fabulous job, it's almost better to watch the screen than the stage itself. The flying camera shots are simply fantastic! The band was in top form and jumped into "You Shook Me All Night Long" without any stop. The crowd was rather responsive; however the majority of those cold Finns ware just politely clapping their hands between songs. A set of the old classic with "Hell's Bell" and "Highway To Hell" and some sing-along to "The Jack" finally made the crowd going and they cheered the usual Angus striptease gratefully. I am always astonished by the energetic performance Angus and Brian deliver. I've already seen the band numerous times live, have seen several concert videos and there wasn't a single moment when I could sense they saved up any of their energy. Angus is still running up and down the stage like 20 years ago and Brian's singing is as powerful as ever. The rest of the band was faceless but tight as always, they leave entertaining to the two frontmen and to the filming and light crew. On top of that we got the Angus statue with red eyes, blowing smoke; the blow-up doll during "Dirty Deeds"; Hell's Bell was hanging there too and the encore featuring "For Those About To Rock" with the usual cannon-fire thing ended with rather spectacular fireworks.  Still the highlight of the show was probably "Hard As A Rock" with the funny video clip running on screen and the audience singing along. 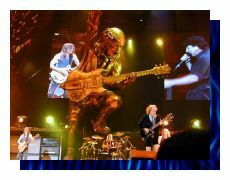 Bottomline of the show (as any AC/DC concert): value for your money: bombastic sound, huge stage with lots of lights, pyro, and gags, entertaining performance, surefire quality gig. I don't think anyone of the 25.000 audience went home disappointed. And yes! There were really 25 thousands. A wonderful thing that there are rock bands that still can fill a stadium and great to see that still there are people going for rock concerts! For those about to rock in Helsinki we Salute you!